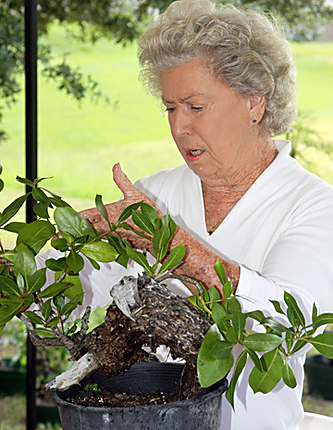 It may sound silly to most people, but to bonsai enthusiasts the nickname “The Buttonwood Queen” is a compliment to the incredible tropical skills of Florida’s Mary Madison, who refined her skills at the elbow of John Naka and Ben Oki. Mary’s knowledge of tropicals is legendary and her trees have been selected for exhibit in the National Bonsai & Penjing Museum at the U.S. National Arboretum. Mary brings her artistry to MHBS on May 18 with a demo and limited-space workshop. Any club member or guest who longs to master tropicals will not want to miss this rare opportunity to learn from Mary Madison. Guests are always welcome at MHBS monthly meetings and demos. To register for the workshop at PFM Bonsai, contact Pauline Muth at 518-882-1039, or pauline@pfmbonsai.com.